The new Mattress Firm location at the corner of Westheimer and Montrose Boulevard is being housed in a former Blockbuster Video space, which should not be surprising considering that the senior vice president of Real Estate and Development for Mattress Firm, Bruce Levy, once worked for Blockbuster. It's been a common theme as the chain continues to expand to new markets. It's something that can be seen in Baton Rouge, Louisiana, Oak Creek, Wisconsin, Sumter, South Carolina, and Asheboro, North Carolina. This strategy makes great sense, as most mattress stores require minimal interior remodeling or design, and many of the now-vacant Blockbuster stores are situated in prime locations with heavy traffic. In Houston we can probably expect other Mattress Firm or Mattress Pro locations to open in former Blockbuster spaces. With nearly 27,000 new apartments ready to come online in the next year, we can probably expect some more Mattress Firm or Mattress Pro openings. Could we see one along Yale Street soon, possibly at the Yale Street Market retail center? It would seem fitting considering the large number of apartment complexes scheduled to be completed or constructed soon, especially along Yale Street and the Washington Avenue corridor. A recent Bloomberg Business article investigated why there are so many Sleepy's mattress stores in New York City, especially in Manhattan, and gives us some of the factors likely considered by Mattress Firm in their site locations. Mattress Firm's growth plan (pages 16-20), marketing scheme (pages 22-25), and commercial real estate deals likely all play a factor in the number and physical location of their stores. As noted in the Bloomberg report, some retail locations may function more like billboards, further solidifying a company's name as an authority in that particular market. Multiple or closely located stores may be the result of real estate transactions that force Mattress Firm to lease additional units in less desirable locations as a result of obtaining other prime locations. Here in the greater Houston area, we're up to 92 Mattress Firm locations, along with 19 Mattress Pro locations that are open, or soon to open. We've seen a few reasons why mattress stores may open in a particular location, but what might be some of the larger underlying factors when considering a mattress market? I used 2013 American Community Survey census tract data to look at some possible trends, along with the geolocated addresses of Mattress Firm and Mattress Pro locations. It should not be a surprise, but most Mattress Firm and Mattress Pro locations are within or adjacent to major thoroughfares, and positioned near more affluent neighborhoods. 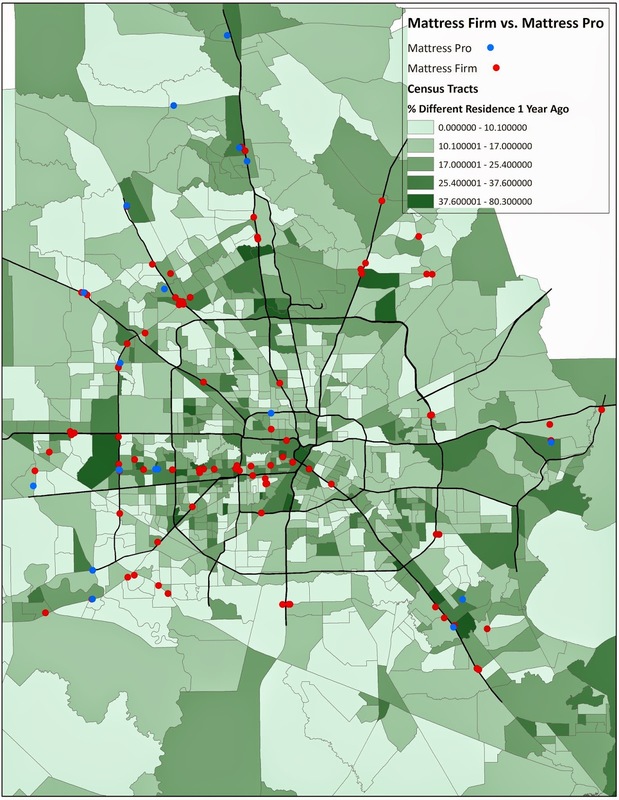 You can see this correlation when we look at median household incomes of census tracts in the Houston region. Buying a mattress set is not cheap. There seems to be a pretty clear correlation between the location of mattress stores and educational attainment, at least with those with a bachelor's degree or higher. Educational attainment will directly correlate with income, so again, this isn't surprising. Mattress Firm and Mattress Pro certainly don't seem to be located in areas of predominantly Spanish speaking residents. There may not be much of a correlation, but it is interesting. You might figure larger concentrations of younger residents would lead to more mattress stores, but that doesn't seem to be the case. Multifamily residences, especially apartments, normally feature more-transient residents, so the need for new bedding materials is probably largest near concentrations of this type of dwelling. This might be one of the stronger correlations of the mattress store location game. Houston continues to attract residents from all over the country, and around the world, so who residents move, they may need to buy new mattresses. Areas with larger percentages of new residents, or residents that live in multifamily rental properties, may have a greater need for bedding. 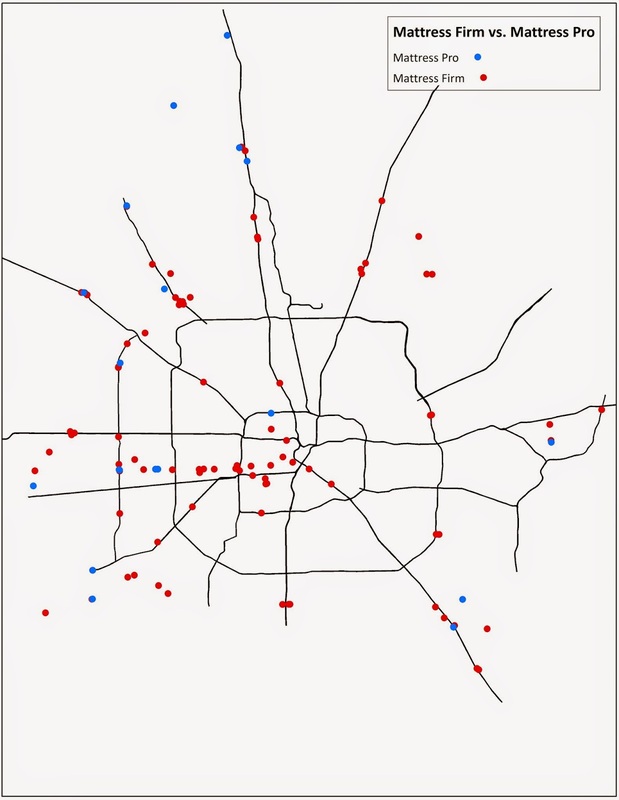 While not all of these data sets help to explain the mattress manifest destiny taking place here in Houston, it does help provide an idea of who Mattress Firm customers might be. Like many other commodities, mattress stores move to areas that contain larger numbers of educated citizens, with moderate to higher incomes, and areas that feature a larger number of multifamily dwellings. This fits the mold for any of the housing along Westheimer. Now we know why we seem to have hit peak mattress along Westheimer. If you want soft, durable sheets that hold their color and maintain their crisp look, buy 100% cotton, single ply sheets. silk sheets king Sheets that are red are actually quite romantic.